The book that generated so much buzz in the blogging community in 2007 has been updated for 2008. This free ebook has shown thousands of bloggers how to create authority WordPress blogs and generates free traffic using all the tools that only WordPress provides. Jack Humphrey at the Friday Traffic Report released the original ‘Black Book’ back in 2007 and it was the main reason for the launch of this site, to provide guides and services to WordPress bloggers to make the most out their blogs using some of the plugins and tactics explained in the Authority Black Book. Updated for 2008 Jack has done it again and for the price of an email address, you can grab yourself a copy. Creating an authority web presence. What it is and how to attain it! Still, Think Web 2.0 Is A Fad? I haven’t gone through the whole thing yet but did study the original ‘Black Book’ thoroughly and I am sure Jack will once again come through with yet another excellent resource for all bloggers especially us WordPress bloggers. The list of recommended plugins is excellent, but I have found some alternatives that are either easier to use or in my opinion better. But that is not the real reason I like the “Black Book’. It is the traffic generation, social marketing, web authority presence that makes it a “must read”. 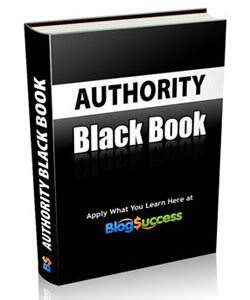 I am in no way affiliated with, nor do I get any compensation for endorsing this great free resource, grab yourself a copy here: Authority Black Book.